2013: The Year of Seattle? We are only nine days into the new year of 2013 and there is a lot of excitement going on with the Sports Landscape in the Pacific Northwest particularly in the city of Seattle. First, there’s the Seattle Seahawks. They got their first road playoff win since 1983 with their win in D.C. against the Redskins. They have probably the most dangerous team in the NFC that no one really wants to face. 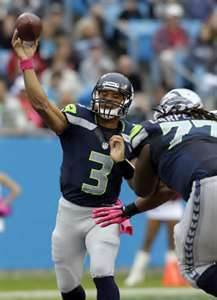 They have a potential Rookie of the Year candidate in Russell Wilson on offense and two on defense (Bruce Irvin, Bobby Wagner). They have a legit chance of getting to the Super Bowl. And this team is young and growing. Then, today there was breaking news from Adrian Wojnarowski, NBA columnist for Yahoo! Sports reporting that the Maloofs are selling the Sacramento Kings to a group led by Chris Hansen. Hansen is one of the key players in trying to get an NBA team back to Seattle & is wanting to build a new arena for that team. The NBA back in Seattle. This is news I’ve been waiting to hear since 2008. As has been mentioned on the podcast and people who know me, I lived in Seattle for three years (from January 2005 to January 2008). I watched several Sonics games down in Key Arena. And I was there at the beginnings of what was documented in the documentary “Sonicsgate” where Clay Bennett and his group came in and took the Sonics away from Seattle and moved them to Oklahoma City (if you have never seen “Sonicsgate, search it on Youtube, the entire doc is on there). From that day forward, I lost all respect for NBA commissioner David Stern and I lost a lot of interest in the NBA. I even pulled for the Miami Heat in the Finals last year because I didn’t want Clay Bennett to have the championship. So when I heard about what Chris Hansen wanted to do last year I got excited about the prospects of Seattle getting a team back. Then the news broke today. And I feel bad for the city of Sacramento and Kings fans. I liked the Kings in the early 2000s with Chris Webber, Jason Williams, Peja Stojakovic and others. Unfortunately, the Maloofs were in a lot of ways like Clay Bennett (and also former Sonics owner Howard Schultz), not great owners. They really didn’t need to be owners so it’s good that guys like Chris Hansen and Steve Ballmer are going to be owners. It’ll be great next season to see the green and gold again. Seattle has a great basketball tradition and it will be well represented again with the SuperSonics back on the court. That’s not even mentioning the Sounders who are perennial contenders for the MLS Cup, the Washington Huskies, who will be moving back to the newly renovated Husky Stadium and should be in contention for the Pac-12 & even the Mariners (who are shortening their fences at Safeco). Loved the Kemp and Payton era and would love to see them back again!